The Atharvaveda (Sanskrit: अथर्ववेद, Atharvaveda from atharvāṇas and veda meaning "knowledge") is the "knowledge storehouse of atharvāṇas, the procedures for everyday life". The text is the fourth Veda, but has been a late addition to the Vedic scriptures of Hinduism. The Atharvaveda is composed in Vedic Sanskrit, and it is a collection of 730 hymns with about 6,000 mantras, divided into 20 books. About a sixth of the Atharvaveda text adapts verses from the Rigveda, and except for Books 15 and 16, the text is in poem form deploying a diversity of Vedic meters. Two different recensions of the text – the Paippalāda and the Śaunakīya – have survived into modern times. Reliable manuscripts of the Paippalada edition were believed to have been lost, but a well-preserved version was discovered among a collection of palm leaf manuscripts in Odisha in 1957. The Atharvaveda is sometimes called the "Veda of magical formulas", an epithet declared to be incorrect by other scholars. The Samhita layer of the text likely represents a developing 2nd millennium BCE tradition of magico-religious rites to address superstitious anxiety, spells to remove maladies believed to be caused by demons, and herbs- and nature-derived potions as medicine. Many books of the Atharvaveda Samhita are dedicated to rituals without magic and to theosophy. The text, states Kenneth Zysk, is one of oldest surviving record of the evolutionary practices in religious medicine and reveals the "earliest forms of folk healing of Indo-European antiquity". It was likely compiled as a Veda contemporaneously with Samaveda and Yajurveda, or about 1200 BC - 1000 BC. Along with the Samhita layer of text, the Atharvaveda includes a Brahmana text, and a final layer of the text that covers philosophical speculations. The latter layer of Atharvaveda text includes three primary Upanishads, influential to various schools of Hindu philosophy. These include the Mundaka Upanishad, the Mandukya Upanishad and the Prashna Upanishad. The Veda may be named, states Monier Williams, after the mythical priest named Atharvan who was first to develop prayers to fire, offer Soma, and who composed "formulas and spells intended to counteract diseases and calamities". Monier Williams notes that the now obsolete term for fire used to be Athar. The name Atharvaveda, states Laurie Patton, is for the text being "Veda of the Atharvāṇas". The oldest name of the text, according to its own verse 10.7.20, was Atharvangirasah, a compound of "Atharvan" and "Angiras", both Vedic scholars. Each school called the text after itself, such as Saunakiya Samhita, meaning the "compiled text of Saunakiya". The "Atharvan" and "Angiras" names, states Maurice Bloomfield, imply different things, with the former considered auspicious while the latter implying hostile sorcery practices. Over time, the positive auspicious side came to be celebrated and the name Atharva Veda became widespread. The latter name Angiras which is linked to Agni and priests in the Vedas, states George Brown, may also be related to Indo-European Angirôs found in an Aramaic text from Nippur. Michael Witzel states Atharvan roots may be *atharwan or "[ancient] priest, sorcerer", with links to Avestan āθrauuan "priest" and Tocharian <*athr, "superior force". The Atharvaveda is also occasionally referred to as Bhrgvangirasah and Brahmaveda, after Bhrigu and Brahma respectively. A page from the Atharva Veda Samhita, its most ancient layer of text. The Atharvaveda is a collection of 20 books, with a total of 730 hymns of about 6,000 stanzas. The text is, state Patrick Olivelle and other scholars, a historical collection of beliefs and rituals addressing practical issues of daily life of the Vedic society, and it is not a liturgical Yajurveda-style collection. The Caraṇavyuha, a later era Sanskrit text, states that the Atharvaveda had nine shakhas, or schools: paippalāda, stauda, mauda, śaunakīya, jājala, jalada, brahmavada, devadarśa and cāraṇavaidyā. Of these, only the Shaunakiya recension, and the more recently discovered manuscripts of Paippalāda recension have survived. The Paippalāda edition is more ancient. The two recensions differ in how they are organized, as well as content. For example, the Book 10 of Paippalada recension is more detailed, more developed and more conspicuous in describing monism, the concept of "oneness of Brahman, all life forms and the world". The Atharvaveda Samhita originally was organized into 18 books (Kāṇḍas), and the last two were added later. These books are arranged neither by subject nor by authors (as is the case with the other Vedas), but by the length of the hymns. Each book generally has hymns of about a similar number of verses, and the surviving manuscripts label the book with the shortest hymns as Book 1, and then in an increasing order (a few manuscripts do the opposite). Most of the hymns are poetic and set to different meters, but about a sixth of the book is prose. Most of the hymns of Atharvaveda are unique to it, except for the one sixth of its hymns that it borrows from the Rigveda, primarily from its 10th mandala. The 19th book was a supplement of a similar nature, likely of new compositions and was added later. The 143 hymns of the 20th book of Atharvaveda Samhita is almost entirely borrowed from the Rigveda. The hymns of Atharvaveda cover a motley of topics, across its twenty books. Roughly, the first seven books focus primarily on magical poems for all sorts of healing and sorcery, and Michael Witzel states these are reminiscent of Germanic and Hittite sorcery stanzas, and may likely be the oldest section. Books 8 to 12 are speculations of a variety of topics, while Books 13 to 18 tend to be about life cycle rites of passage rituals. The Srautasutra texts Vaitāna Sūtra and the Kauśika Sūtra are attached to the Atharvaveda Shaunaka edition, as are a supplement of Atharvan Prayascitthas, two Pratishakhyas, and a collection of Parisisthas. For the Paippalada edition of Atharvaveda, corresponding texts were Agastya and Paithinasi Sutras but these are lost or yet to be discovered. The ancient Indian tradition initially recognized only three Vedas. The Rigveda, the verse 3.12.9.1 of Taittiriya Brahmana, the verse 5.32-33 of Aitareya Brahmana and other Vedic era texts mention only three Vedas. The acceptance of the Atharvanas hymns and traditional folk practices was slow, and it was accepted as another Veda much later than the first three, by both orthodox and heterodox traditions of Indian philosophies. The early Buddhist Nikaya texts, for example, do not recognize Atharvaveda as the fourth Veda, and make references to only three Vedas. Olson states that the ultimate acceptance of Atharvaveda as the fourth Veda probably came in the 2nd half of the 1st millennium BCE. However, notes Max Muller, the hymns of Atharvaveda existed by the time Chandogya Upanishad was completed (~700 BCE), but were then referred to as "hymns of Atharvangirasah". Frits Staal states that the text may be a compilation of poetry and knowledge that developed in two different regions of ancient India, the Kuru region in northern India and the Pancalas region of eastern India. The former was home to Paippalāda, whose name was derived from the sacred fig tree named Pippala (Sanskrit: पिप्पल). This school's compositions were in the Rigvedic style. The Pancalas region contributions came from composer-priests Angirasas and Bhargavas, whose style was unlike the metric Rigvedic composition, and their content included forms of medical sorcery. The Atharvaveda editions now known are a combination of their compositions. The core text of the Atharvaveda falls within the classical Mantra period of Vedic Sanskrit, during the 2nd millennium BC - younger than the Rigveda, and roughly contemporary with the Yajurveda mantras, the Rigvedic Khilani, and the Sāmaveda. There is no absolute dating of any Vedic text including the Atharvaveda. 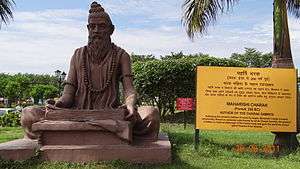 The dating for Atharvaveda is derived from the new metals and items mentioned therein; it, for example, mentions iron (as krsna ayas, literally "black metal"), and such mentions have led the scholars to the estimate that the Atharvaveda hymns were compiled in the early Indian Iron Age, c. 1200 to 1000 BC, corresponding to the early Kuru Kingdom. The Atharvaveda Samhita contains hymns many of which were charms, magic spells and incantations meant to be pronounced by the person who seeks some benefit, or more often by a sorcerer who would say it on his or her behalf. The most frequent goal of these hymns charms and spells were long life of a loved one or recovery from some illness. In these cases, the affected would be given substances such as a plant (leaf, seed, root) and an amulet. Some magic spells were for soldiers going to war with the goal of defeating the enemy, others for anxious lovers seeking to remove rivals or to attract the lover who is less than interested, some for success at a sporting event, in economic activity, for bounty of cattle and crops, or removal of petty pest bothering a household. Some hymns were not about magic spells and charms, but prayer qua prayer and philosophical speculations. The spirit of the two collections [Rigveda, Atharvaveda] is indeed widely different. In the Rigveda there breathes a lively natural feeling, a warm love for nature; while in the Atharva there prevails, on the contrary, only an anxious dread of her evil spirits and their magical powers. In the Rigveda we find the people in a state of free activity and independence; in the Atharva we see it bound in the fetters of the hierarchy and superstition. Jan Gonda cautions that it would be incorrect to label Atharvaveda Samhita as mere compilation of magical formulas, witchcraft and sorcery. While such verses are indeed present in the Samhita layer, a significant portion of the Samhita text are hymns for domestic rituals without magic or spells, and some are theosophical speculations such as "all Vedic gods are One". Additionally, the non-Samhita layers of Atharvaveda text include a Brahmana and several influential Upanishads. together what of the flesh fallen apart, together sinew and together your bone. Let marrow come together with marrow, let bone grow over together with bone. We put together your sinew with sinew, let skin grow with skin. let them send the ten days fever far away from us. Disappear from here to the Maratas. Neither a small one, nor a grown-up weeps here from desire of fever. Do not harm our boys, do not harm our girls. O fever, avoid us with them. the dusky tinted, and the black – all Plants we summon hitherward. I call for thee the fibrous, and the reed like, and branching plants, dear to Vishwa Devas, powerful, giving life to men. Therewith deliver this man here from this consumption, O ye Plants: so I prepare the remedy. The contents of Atharvaveda have been studied to glean information about the social and cultural mores in Vedic era of India. A number of verses relate to spells for gaining a husband, or a wife, or love of a woman, or to prevent any rivals from winning over one's "love interest". May O Agni!, a suitor after our own heart come to us, may he come to this maiden with fortune! thus may this woman be a favourite of fortune, beloved, not at odds with her husband! upon this bring, hither the suitor who shall be agreeable to thee! turn thou the attention of every agreeable suitor towards her! The Atharvaveda Samhita, as with the other Vedas, includes some hymns such as 4.1, 5.6, 10.7, 13.4, 17.1, 19.53-54, with metaphysical questions on the nature of existence, man, heaven and hell, good and evil. Hymn 10.7 of Atharvaveda, for example, asks questions such as "what is the source of cosmic order? what and where is planted this notion of faith, holy duty, truth? how is earth and sky held? is there space beyond the sky? what are seasons and where do they go? does Skambha (literally "cosmic pillar", synonym for Brahman) penetrate everything or just somethings? does Skambha know the future? is Skambha the basis of Law, Devotion and Belief? who or what is Skambha?" who gathered the breast, the neck bones of man? how many disposed the two teats? who the two collar bones? how many gathered the shoulder bones? how many the ribs? Who brought together his two arms, saying, "he must perform heroism?" (...) Which was the god who produced his brain, his forehead, his hindhead? (...) Whence now in man come mishap, ruin, perdition, misery? accomplishment, success, non-failure? whence thought? What one god set sacrifice in man here? who set in him truth? who untruth? whence death? whence the immortal? The Atharvaveda, like other Vedic texts, states William Norman Brown, goes beyond the duality of heaven and hell, and speculates on the idea of Skambha or Brahman as the all pervasive monism. Good and evil, Sat and Asat (truth and untruth) are conceptualized differently in these hymns of Atharvaveda, and the Vedic thought, wherein these are not dualistic explanation of nature of creation, universe or man, rather the text transcends these and the duality therein. Order is established out of chaos, truth is established out of untruth, by a process and universal principles that transcend good and evil. Do ye, O Asvins, in this place join us in sympathy and love. Around us rise no din of frequent slaughter, nor Indra's arrow fly, for day is present ! The Atharvaveda includes Gopatha Brahmana text, that goes with Atharva Samhita. The Atharvaveda has three primary Upanishads embedded within it. The Mundaka Upanishad, embedded inside Atharvaveda, is a poetic-style Upanishad, with 64 verses, written in the form of mantras. However, these mantras are not used in rituals, rather they are used for teaching and meditation on spiritual knowledge. In ancient and medieval era Indian literature and commentaries, the Mundaka Upanishad is referred to as one of the Mantra Upanishads. The Mundaka Upanishad contains three Mundakams (parts), each with two sections. The first Mundakam, states Roer, defines the science of "Higher Knowledge" and "Lower Knowledge", and then asserts that acts of oblations and pious gifts are foolish, and do nothing to reduce unhappiness in current life or next, rather it is knowledge that frees. The second Mundakam describes the nature of the Brahman, the Atman (Self, Soul), and the path to know Brahman. The third Mundakam continues the discussion and then asserts that the state of knowing Brahman is one of freedom, fearlessness, liberation and bliss. The Mundaka Upanishad is one of text that discuss the pantheism theory in Hindu scriptures. The text, like other Upanishads, also discusses ethics. Through continuous pursuit of Satya (truthfulness), Tapas (perseverance, austerity), Samyajñāna (correct knowledge), and Brahmacharya, one attains Atman (Self, Soul). The Mandukya Upanishad is the shortest of all the Upanishads, found in the Atharvaveda text. The text discusses the syllable Om, presents the theory of four states of consciousness, asserts the existence and nature of Atman (Soul, Self). The Mandukya Upanishad is notable for inspiring Gaudapada's Karika, a classic for the Vedanta school of Hinduism. Mandukya Upanishad is among the oft cited texts on chronology and philosophical relationship between Hinduism and Buddhism. The Prashna Upanishad is from the Paippalada school of Atharvavedins. The text contains six Prashna (questions), and each is a chapter with a discussion of answers. The first three questions are profound metaphysical questions but, states Eduard Roer, do not contain any defined, philosophical answers, are mostly embellished mythology and symbolism. The fourth section, in contrast, contains substantial philosophy. 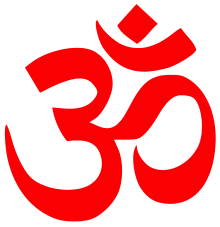 The last two sections discuss the symbol Om and Moksha concept. The Prashna Upanishad is notable for its structure and sociological insights into the education process in ancient India. The Shaunakiya text was published by Rudolf Roth and William Dwight Whitney in 1856, by Shankar Pandurang Pandit in the 1890s, and by Vishva Bandhu in 1960–1962. Ralph Griffith translated some chapters into English in 1897, while Maurice Bloomfield published one of the most relied upon translations of the Shaunakiya recension of Atharvaveda in 1899. 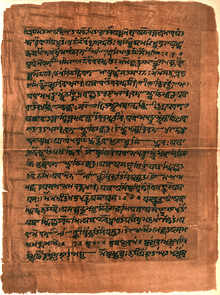 A corrupted and badly damaged version of the Paippalāda text was edited by Leroy Carr Barret from 1905 to 1940 from a single Kashmirian Śāradā manuscript (now in Tübingen). Durgamohan Bhattacharyya’s discovered palm leaf manuscripts of the Paippalada recension in Odisha in 1957. His son Dipak Bhattacharya has published the manuscripts. Thomas Zehnder translated Book 2 of the Paippalada recension into German in 1999, and Arlo Griffiths, Alexander Lubotsky and Carlos Lopez have separately published English translations of its Books 5 through 15. Rishi Caraka (above), the author of Caraka Samhita credits Atharvaveda as an inspiration. Therefore, the physician who has inquired [in verse 30.20] about [which Veda], devotion to the Atharvaveda is ordered from among the four: Rigveda, Samaveda, Yajurveda and Atharvaveda. The roots of Ayurveda – a traditional medical and health care practice in India—states Dominik Wujastyk, are in Hindu texts of Caraka Samhita and Sushruta Samhita, both of which claim their allegiance and inspiration to be the Vedas, especially Atharvaveda. Khare and Katiyar state that the Indian tradition directly links Ayurveda to Atharvaveda. Wujastyk clarifies that the Vedic texts are more a religious discourse, and while herbal health care traditions can be found in Atharvaveda, the purely medical literature of ancient India are actually Caraka Samhita and Sushruta Samhita, these two are the real roots of Ayurveda. Kenneth Zysk adds Bhela Samhita to this list. The verse 11.7.24 of Atharvaveda contains the oldest known mention of the Indic literary genre the Puranas. The 1st millennium AD Buddhist literature included books of magico-religious mantras and spells for protection from evil influences of non-human beings such as demons and ghosts. These were called Pirita (Pali: Paritta) and Rakkhamanta ("mantra for protection"), and they share premises and style of hymns found in Atharvaveda. 1 2 3 4 Jan Gonda (1975), Vedic Literature: Saṃhitās and Brāhmaṇas, Vol 1, Fasc. 1, Otto Harrassowitz Verlag, ISBN 978-3447016032, pages 277-280, Quote: "It would be incorrect to describe the Atharvaveda Samhita as a collection of magical formulas". ↑ M. S. Valiathan. The Legacy of Caraka. Orient Blackswan. p. 22. ↑ Michael Witzel (1997). "The Development of the Vedic Canon and its Schools : The Social and Political Milieu. Harvard University, Harvard Oriental Series." (PDF). Retrieved 30 June 2014. ↑ Michael Witzel. "Autochthonous Aryans?The Evidence from Old Indian and Iranian Texts." (PDF). ↑ Michael Witzel. "Early Sanskritization.Origins and Development of the Kuru State." (PDF).